Note: This is the seventh post in our "Species of the Month" series, written by Park Ecologist Peter VanLinn. It's one of several 2014 initiatives meant to share knowledge we have about the Park with those who love it. As a second follow-up to Forest Park Forever's successful Give STL Day effort in May — during which generous supporters donated nearly $12,000 for butterfly habitats in the Park — we are focusing our Species of the Month post on the Monarch Butterfly. July is the peak of breeding season for this species in the St. Louis/Missouri region. They have become much less visible in recent years due to continual declines in numbers, but anyone who sees one can report it to monarchwatch.org in order to help build a database of information for scientist to use while researching ways to conserve and protect the country’s most recognizable butterfly. We hope everyone is also aware of the City of St. Louis' Milkweed for Monarchs Initiative, which has gained well-deserved publicity in recent months. Much of this local butterfly momentum will culminate here in Forest Park during this year’s BioBlitz, which is scheduled for Sept. 26th and 27th. Park Locations: Throughout Forest Park, especially in open natural areas containing wildflowers, such as Kennedy Savanna, Hidden Creek Savanna, Deer Lake Savanna and Steinberg Prairie. Description: Adults are a rusty or tawny orange on upper surface of the wings with black veins; wing edges are black with two series of small white spots. Undersides of wings are lighter orange to yellow or brown. Females exhibit darker veins and males have a black spot (a patch of androconial scales) on their hindwings. Larvae are white with black and yellow bands; the head is white with yellow and black markings; a pair of black filaments exists at each end of the caterpillar. Longevity: Summer generations live only 2 – 6 weeks, having up to 4 generations in one summer season. However, some Monarchs that migrate back to Mexico in the fall stay alive all winter and can live for 6 – 8 months. Distribution: Statewide throughout Missouri; Nationwide throughout from southern Canada to South America and globally into areas of the Caribbean, Western Europe, Australia and New Zealand. Habitat and Conservation: Monarchs are found in a wide variety of habitats including: fields, forests, prairies and grasslands, roadsides, and urban and suburban gardens and plantings. Famous for their annual migration to overwinter in Mexico, these butterflies face declining numbers due to habitat loss in the U.S. and deforestation in the Mexican wintering grounds. Efforts to protect our nation’s most recognizable butterfly species are underway including encouraging Missouri residents to plant native milkweed species as a food supply for larvae and a nectar source for the adults. Life Cycle: Up to 4 generations are produced in broods through summer and fall in Missouri. Adults migrate to Mexico in the late summer and fall. In early spring the adults migrate north, reproducing along the way in Oklahoma and Texas. Eventually the offspring continue northward to return to Missouri some generations later. Eggs are laid in the spring and summer and hatch in about 4 days. 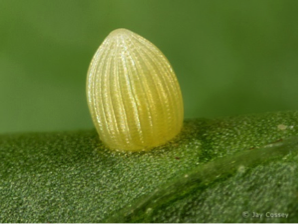 Eggs are often laid on milkweed plants which are used as food for the caterpillars. Caterpillars enter the chrysalis stage after about 2 weeks and emerge 2 weeks later as an adult butterfly. Behavior: Mating begins in the spring but is at its peak in Missouri during the month of July. Courtship consists of two phases; the aerial phase and the ground phase. During the aerial phase a male pursues, nudges, and eventually grounds the female. Copulation occurs during the ground phase where the male and female will remain attached for 30 to 60 minutes. Monarchs are one species of butterfly that use a predator defense mechanism known as aposematism, or warning coloration. This means the bright coloration of the monarch’s wings warn predators of an undesirable or harmful taste in order to keep predators from trying to eat them. In fact, monarchs are even poisonous to some predators if eaten due to the presence of heart arresting compounds which build up from the large amounts of milkweed eaten by the larvae. Food: Monarch larvae feed on a wide variety of milkweeds which contain cardiac glycosides. These chemical compounds are what cause the butterfly to be unpalatable or even poisonous to predators. As adults, monarchs consume nectar from a wide variety of wildflowers. Human Connections: Monarchs are popular with gardeners and nature watchers and because monarchs are important pollinators, many people have stopped using harmful pesticides including neonicotinoids. Humans can also promote pollination and monarch populations by planting monarch waystations. These waystations consist of small plantings of milkweed and other nearing wildflowers for monarchs to uses as feeding, mating, and brooding sites along their migratory path. Additionally, many educators raise monarchs to use as a model for teaching insect lifecycles to their students. Some states have even declared the monarch as the state insect. Ecosystem Connection: Monarchs play an important role as a pollinator in all the ecosystems they pass through along their migration routes. Despite the monarch’s general toxicity, some preadators can eat them. Addiontally, they developed as a mimic with the simlar looking viceroy butterfly, each mimicking the others warning coloration. Note: This information has been collected from the following locations: The Missouri Department of Conservation: Online Field Guide; Monarch Watch: Monarch Butterfly: Journey North; and Butterflies and Moths of Missouri, by J. Richard and Joan E. Heitzman.